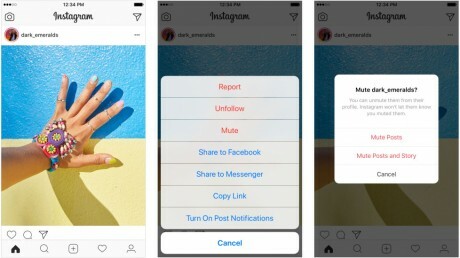 Instagram today rolled out a new tool called mute, what is describes as a new way for people to control what they see in their Instagram feed. "The new feature lets you hide posts in [your] feed from certain accounts, without unfollowing them. With this change, you can make your feed even more personalized to what matters to you," explained Instagram. People can opt to mute posts, or posts and stories. Muted accounts are still visible via the profile page, and will still push notifications about comments or tagged posts. Instagram says muted account holders will not be notified that they've been muted, and users can unmute accounts at any time. The new feature is being added to the Android and iOS version of Instagram, which is free to download. Instagram today gave people more control over who sees their stories. A new tool called Close Friends lets people create small groups and share stories that are only visible to members of that group.